Many people get their best referrals from key people in your network. It's easier since someone else is opening the doors. learning to use / benefit from your networking circles. This is a replay of the April 23rd webcast. Given how crazy busy most people think they are today, having face to face chances to ask for referrals is a challenge. This webcast focuses on getting referrals from calls and virtual referral requests. If you're not happy with your results, you need to ask more. This webcast tells you how to do this effectively. Do you feel you’re doing everything right and you’re still not reaching your goals? Once you learn the principles that Ellen Rogin is going to show you, you can create your best life - no matter what happens in your life! What are the most important things to laser in on to get more and better referrals? This webcast will cover not only what to DO, but also how top referral getters think differently than most people in business development and the character traits you need to get you there. Most companies operate in the false hope that the present is somewhat connected to the future. So if we just do a good enough job today, we will be somewhat safe tomorrow.Nothing could be further from the truth. In reality, industries, markets and societies are shaped by discontinuities. Innovation, as we know, is more of a destructive than creative exercise. In this session, you will learn about what companies that have thrived in times of disruption, turbulence and rapid change have in common. Learn the steps to creating daily victories for you, your clients and the important relationships within their life. - Inspire the reader to live the life that is truly life. To take the first step forward in choosing the mental, physical and spiritual life that they want now and forever. - Educate the attendee on the “How to”; the process of the six steps to daily victories. - Through personal story telling, the attendee will see and feel the benefits of utilizing the six step process and celebrating daily victories. 5. Learn how persistence creates discipline. Every advisory firm we work with swears blind they have their client segmentation in order. Our experience suggests otherwise – in fact not once, ever have I been into a firm that had this nailed. Even the firms that have taken some steps in the right direction are not extracting full value from the effort they've made. Our data shows that firms that segment their client base to stage 1 increase profitability by 154% over firms with no segmentation strategy. However, take this onto stage 2 and stage 3 using some more advanced segmentation strategies (which we’ll show you in the webcast) and you can increase business profitability by 515%. That’s just got to get your attention. The information in this webcast is easy to understand, completely implementable and delivers results proven through our industry research and coalface experience. Everyone wants more referrals. Why is it that some people have so much more success than others when it comes to bringing in more referrals? It’s not just a one-liner or a simple system; it’s also how top referral-getters think and character traits they’ve developed. The good news is that it can all be learned and that if others have done it, you can too. Join this webcast to identify the key areas that you have covered already and that you want to master so you can generate the business you want. 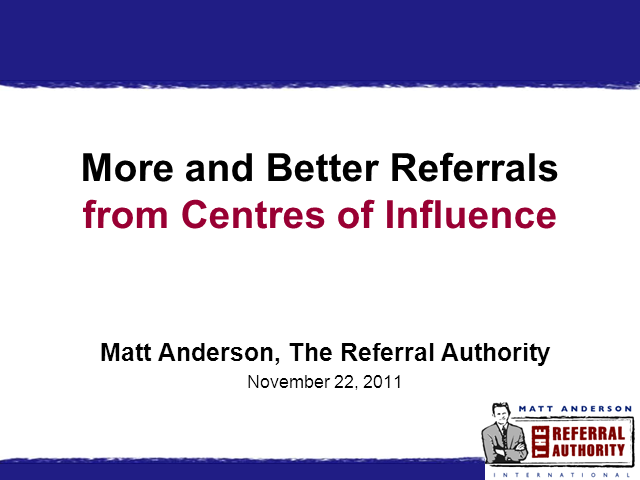 Your ability to get more and better referrals is frequently related very closely to your confidence levels. What are those intangibles that seem to generate far more referrals for some people - rather than others who are just as competent and trustworthy (if not more so)? This webcast will shed light on specific things you can do more proactively to benefit from these 6 rules. The more deliberately you apply these rules, the more business you will get. Is your your referral asking somewhat random? In this webcast you will learn how to develop a system that gets very comfortable with a little practice. It is based on the 6 key parts that make up an effective, flowing conversation - a train of thought. This knowledge will give you the competence which breeds the confidence and then gets you the results. Most people do not know how to refer you. As a result, you have many potential referral sources doing nothing. They need you to make it easy for them by showing them how. This webcast will cover how to help others open doors for you, so that you have a chance to schedule a meeting and generate more and better prospects! Saying “if you can think of anyone else that benefit from my services, please have them give me a call” rarely leads to referrals. So what can you say and do to get the results you want? Webcasts for sales and business development professionals on how to get more and better referrals.